Sometimes good nature photography requires some suffering. In the case of this image, the suffering translated to very wet pants on a cold windy day. Rain cover for the camera; check. The umbrella helped keep the front element of the camera dry but with the raining coming down sideways, it did little to keep my dry. It only took a few minutes for my jeans to be completely. The rain stopped after about 15 minutes but the wind coming through my cold, wet, pants reminded me of the event for the rest of the afternoon. I could have hid in the car until the rain subsided but I’d have never gotten this shot. Being warm and dry isn’t always all that it’s cracked up to be. I’ve been doing most of my shooting with my 7D but I wanted to go wider than the 24-70 would go on that body so I switched to my 5D for this shot. As much as I like the features and viewfinder on the 7D, there’s just something about a full frame sensor that can’t be duplicated. 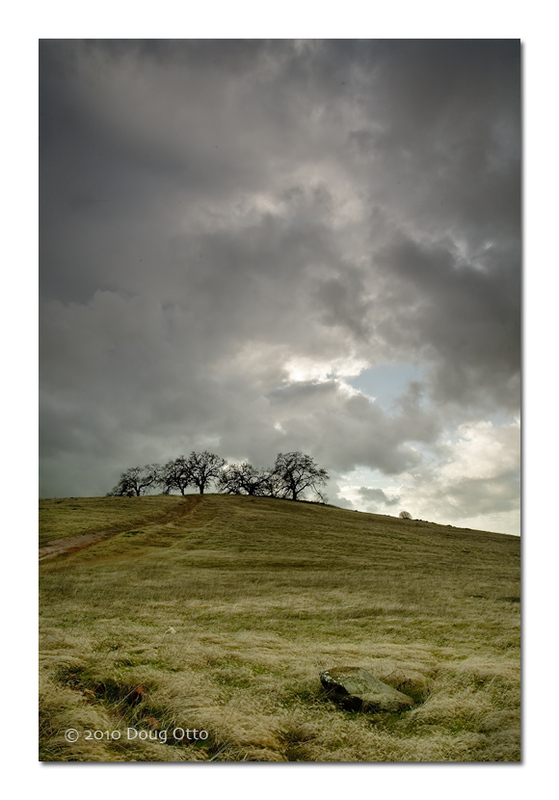 This entry was posted in Photography and tagged Canon 17-40 f/4L, Canon 5D, clouds, doug otto, dramatic sky, eldorado hills, Photography, rain. Bookmark the permalink.